Posted on May 28, 2017 by Matthew Mahalik. For days, computer models had consistently shown near-record levels of heat and humidity today, with temperatures soaring into the upper 90s and dew points approaching a downright miserable 80 degrees. We could break a sweat just by opening the window. Ironic, since the day before, it was too dry for storms to develop. Throughout the midday, the extreme instability made itself known in the form of unusually strong midlevel updrafts, producing the altocumulus cloud field so many storm chasers look for on outbreak days. 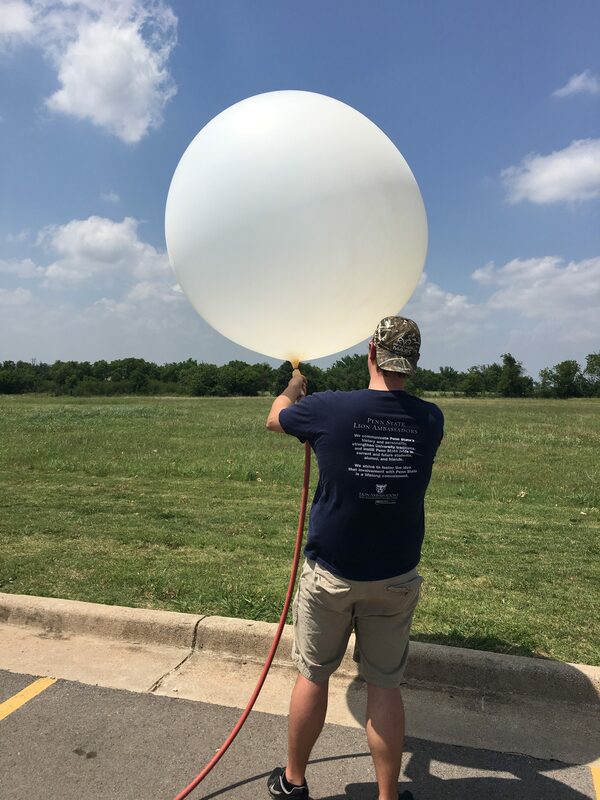 Our first balloon launch of the day in the early afternoon just south of Norman showed extreme instability — on the order of 6000 J/kg of CAPE (Convective Available Potential Energy). For reference, CAPE over 2000 J/kg is considered high. From there we drifted south, closer to the dryline itself. A couple hours later, another sounding revealed the cap was still quite stout but eroding. And all the sunlight was heating the surface layer, increasing the CAPE to an astounding 7000+ J/kg. This data was used by the NOAA Storm Prediction Center and the National Weather Service to update their forecasts and tornado watch, and even resulted in a special SPC mesoscale discussion that warned about imminent explosive storm development. A little after 4 p.m., one or two small cumulus towers were just strong enough to punch through whatever cap was left. These updrafts were able to tap into the rich, energetic mid-levels, and from there it was off to the races. Our last sounding resulted in an incredibly large 7866 J/kg of CAPE with no remaining cap to suppress the storms. With this much energy available, the storm exploded. We were extremely fortunate to have a road network directly in the storm’s path. For the next two-plus hours, we completed transects across the storm’s hook, inflow, and forward flank of heavy precipitation. Along the way, we noticed striking changes in wind direction and temperature. Early evidence shows these are signs of potential vorticity rivers feeding from the precipitation core toward the updraft. Some of these wind-shifts occurred right as the temperature spiked — at times enough to fog up our windows for a few seconds before returning to the same antecedent conditions. We found a handful of these features, but they disappeared about as quickly as we could find them. The data collected is very encouraging and we were able to work in precisely the correct part of the storm without too much difficulty. After four days of traveling, we were ready for some sleep and a restful Memorial Day.